Robert Griffin III cards are among the hottest in the hobby right now. Everything to do with the rookie quarterback is hobby gold. Panini has announced an added RG3 chase for 2012 Panini Prominence Football. The first collector to spell "G-R-I-F-F-I-N" using Rookie Class Signatures cards and having it verified by Panini will get three "I" cards. 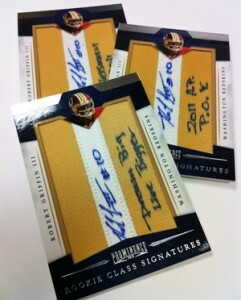 Rookie Class Signatures are one of five levels of rookie cards in 2012 Panini Prominence. The cards use manufactured letter patches that have been autographed by the player. According to images released by Panini, all three of the prize cards have been signed by Griffin on the letter. They are also inscribed on the fabric piece used as a backdrop for the letter. The inscriptions shown are, "Dream Big Live Bigger," "Heisman 2011," and "2011 A.P. P.O.Y." Collectors who spell "Griffin" with the Rookie Class Signatures cards must email Panini once they have all seven cards in hand to check too see if they're the first person to complete the challenge. They will also be required to mail the cards to Panini for verification. 2012 Topps SUPER BOWL XLVII PATCH Robert RG3 Griffin III RC! LOT BGS 9.5! 1 1!